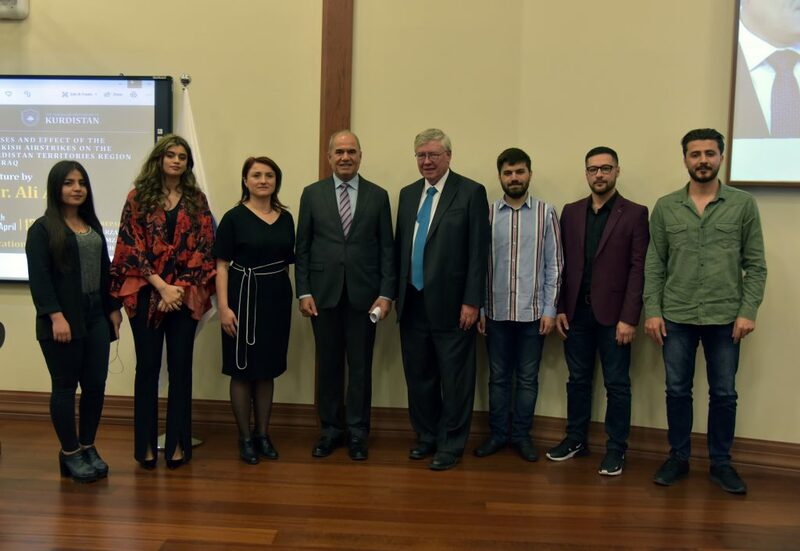 Duhok, Kurdistan Region of Iraq – April 9th, 2019- College of International Studies of the American University of Kurdistan organized a seminar for Kurdish prominent politician Mr. Ali Awni. Attended by the students of departments of international studies of AUK and University of Duhok and in the presence of AUK President Dr. John Menzies, the lecture highlighted KRG’s relations with surrounding countries. Three students of the State and Nation course (Barzan Hali, Hamza Abdulrahman and Rozh Taher) have organized this semniar as a part of their course assignment. “We are very happy for Mr. Ali Awni’s acceptance to our invitation to give a lecture on the causes and effects of the Turkish airstrikes on the territory of Iraq.” Said Barzan Hali, one of the student organizers. Born in 1967, Mr. Ali Awni is a member of Kurdistan Democratic Party (KDP) leadership council. He graduated from Salahaddin University and earned his Master degree in Kurdish literature. He started his political activities in 1985 in Iran. After his return to Kurdistan region, he was – among others – the head of the Kurdistan Student Union, head of the KDP branch in Zakho, head of the central organization and head of the KDP branch in Shexan. Currently Mr. Ali Awni is the head of Soran KDP branch. “I hope this event will be of benefit to our students from multiple points of view. They will create first-hand experience in dealing with organizing the content and form of a public seminar, take care of their audience, take responsibility and ownership of what they know and what they can do.” Said Dr. Angela Movileanu, faculty member of College of International Studies. College of International Studies aims to become a leading academic hub both in Kurdistan and in the Middle East while keeping in line with the international education standards.